When Oscar first started school, I was really shocked to find that at the end of the school day he often had a bit of a whiff about him. I always assumed that children didn’t really get body odour until they hit the puberty years, however, this isn’t the case and childrens’ body odour is now actually quite common. 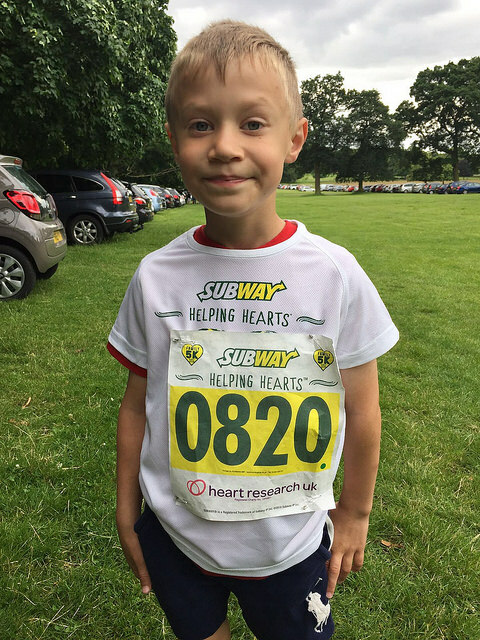 After speaking to a few friends with children of similar ages, it was clear Oscar wasn’t the only one and that school-age children, particularly boys, often sweat a lot and as a result can sometimes pong a bit! I suppose it makes sense – they literally run around like crazy people, so it’s inevitable that they are going to get sweaty, and after a long day at school this is going to leave them a bit whiffy. Children are also hitting puberty much earlier than previous generations and as a result start to show signs e.g. body odour at a much earlier age than you might expect. 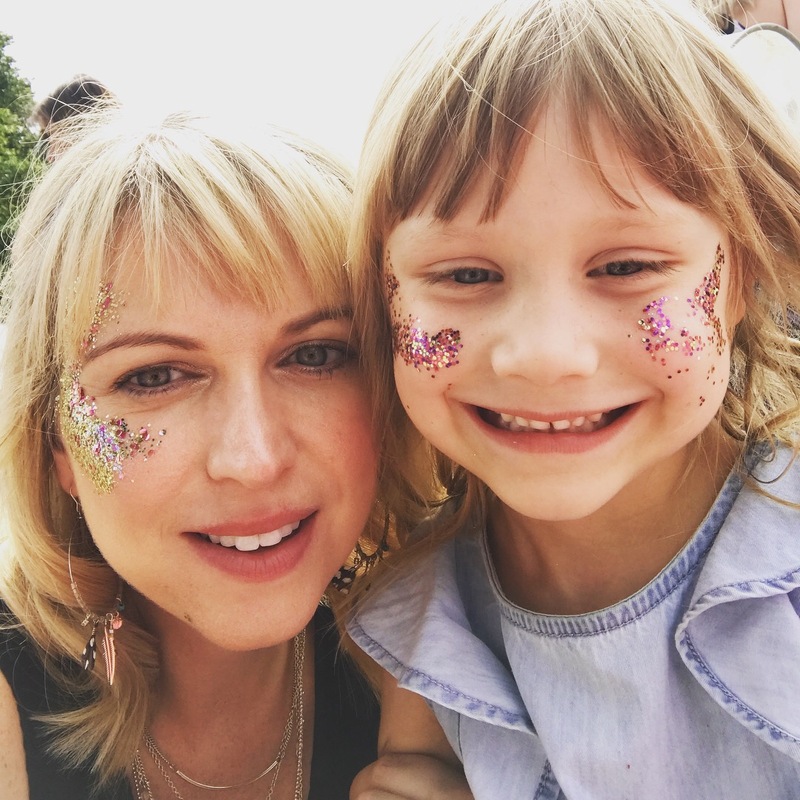 Girls are starting their periods earlier then ever before – 50% of girls in the UK are starting their periods at 10, with 1-in-6 starting younger than this! Chilren are starting to go through puberty earlier than previously due to improvements in childhood nutrition and a reduction in childhood diseases and infections; stress, chemicals and disruption also have an impact on early puberty. I was actually quite shocked and a bit saddened by the information I came across – surely my baby boy is years away from puberty?! However, I realised that there’s no point burying my end in the sand – he was a bit smelly and I needed to sort it! I hated the fact that my little baby boy was coming home a bit whiffy and was worried about the possibility that he might get mocked by his friends as a result (kids can be so cruel). I started to make sure Oscar had plenty of showers and baths, and that he had a clean uniform on everyday. I also started to explore deodorants made specifically for kids and was surprised to find that it was actually quite difficult to find one. I didn’t want him to be using one that contained a load of harsh chemicals and wanted something a bit kinder. I had just started using the Forever Aloe roll-on myself, which doesn’t contain any nasties, so I started encouraging Oscar to use it too. 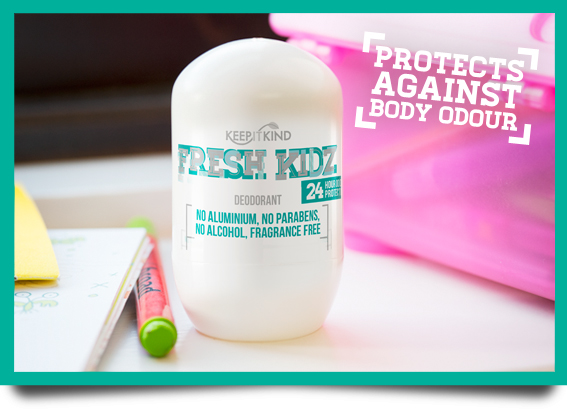 I then came across a company called Keep IT Kind Deodorants who a produce a range of deodorants designed especially for children and young teens, aged between 8 and 16. Their products contain natural ingredients and provide all-day odour protection by inhibiting the growth of bacteria, the main cause of body odour, whilst still allowing the skin to breathe. 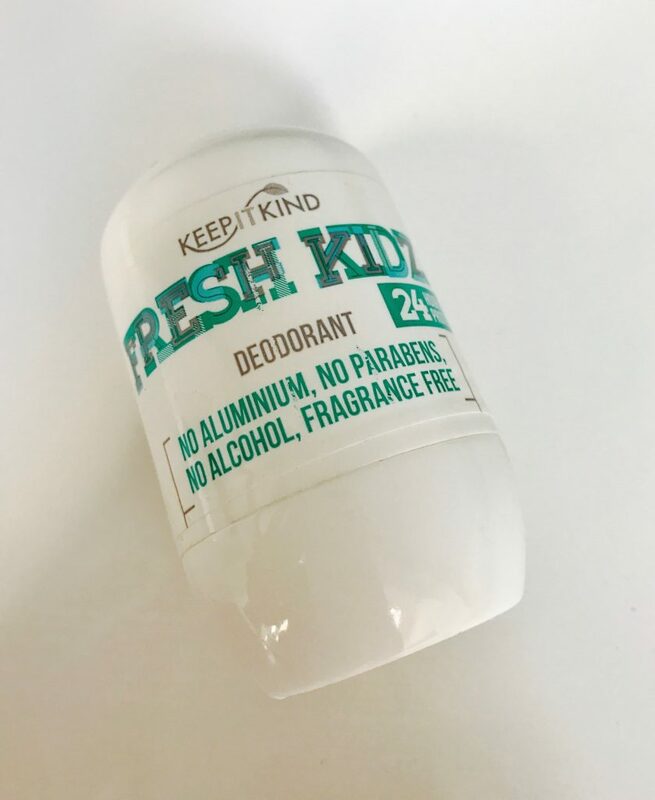 I got in touch with them and they kindly sent me a couple of samples of their Fresh Kidz roll-on deodorant, which is unisex and fragrance-free. I was really impressed with the child-friendly design, which was not only appealing, but also made the product really easy to use. Oscar has been using the Fresh Kidz roll-on for about six months now and it seems to be working really well. He likes that he has his own special deodorant and I love the fact that it’s natural, doesn’t contain any harsh chemicals and is kind on his skin – plus he no longer stinks at the end of the day! It’s clear that body odour in kids is quite common, it just seems to be bit taboo. I’m hoping that sharing my experience helps reassure others that it’s actually really normal and there are suitable products to deal with it. I’d love to hear from others who’ve experienced this with their kids. Disclaimer: Although I was kindly sent samples of the Fresh Kidz roll-on for Oscar, as always my thoughts and opinions are completely my own.